Spring and Autumn are the times to see unusual birds in the village as they pass through on their long-haul migration to and from northern Europe and tropical Africa. 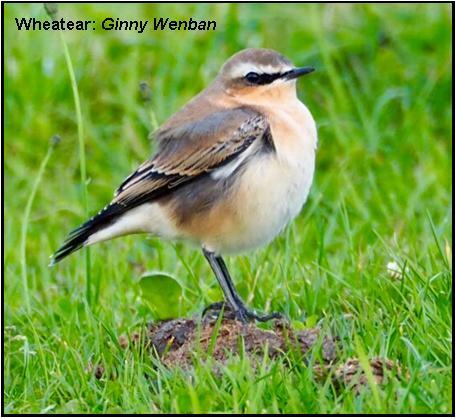 A bird you may be lucky enough to see is the Wheatear. A relative of the Robin, it was once commonly referred to as ‘the White Arse’ because of its conspicuous white rump, but Victorian sensitivities demanded it be renamed! It breeds in the north of the UK and as far north as Greenland and winters in Africa. One was recently seen in the field at the Horseshoes riding school; wheatears like to perch on a raised rock, or piles of horse manure in this case, from which they pounce on their insect prey! 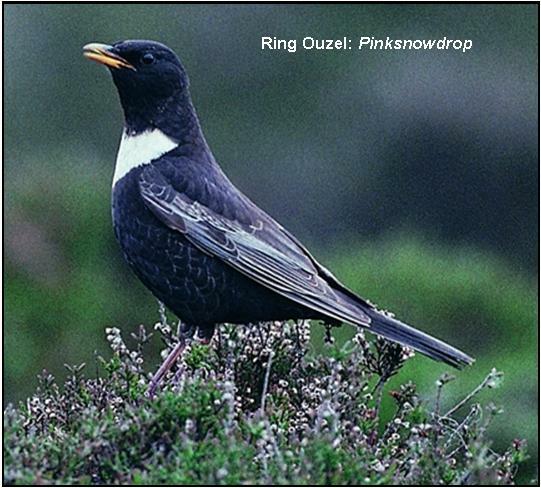 Another possible passing visitor is the Ring Ouzel – yes, it is a bird! It's a close relative of the Blackbird that nests on high ground or mountainous terrain in the north of England and winters in the Atlas Mountains in North Africa. Small birds migrate at night, so keep your eyes open if you walk your dog first thing in the morning as the migrants are busily searching for food to top-up their fat supplies before embarking on the next leg of their journey. It isn’t just the birds that winter in Africa that are on the move. 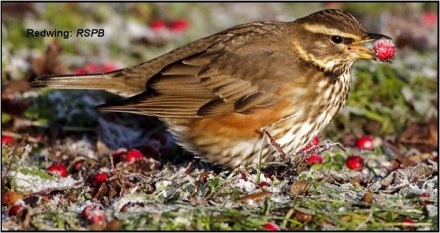 Later this month will see the arrival of fieldfares and redwings, close relatives of blackbirds and thrushes, from Scandinavia. I usually hear them before I see them: fieldfares are noisy birds uttering loud ‘chack-chack’ calls as they forage in the orchards or on ploughed fields; the smaller redwings, which are like song-thrushes with an orange blush under their wings – hence the name – make a high pitched ‘see-see’ call as they fly overhead, often at night. Strangely, while we play winter host to these northern thrushes, many of ‘our’ thrushes and blackbirds move south and west too, especially if we experience hard weather. So your regular garden blackbird, robin or chaffinch may be feeding in a garden in Cornwall, or even France or Spain, while their regular place in your garden is gratefully taken by birds from northern or central Europe.